Well friends and strangers, it’s time to take action without further delay. In the coming weeks I will be sharing details about the book I have written and how you may obtain a copy. I have chosen to go the self-publishing route which means this book (in both book form and Kindle download) will be available very, very soon. I have some mock-ups for the front and back covers as well as a Table of Contents for your perusal today. If you are a military spouse or know of someone who is, I would absolutely love it if you would share this post with them. 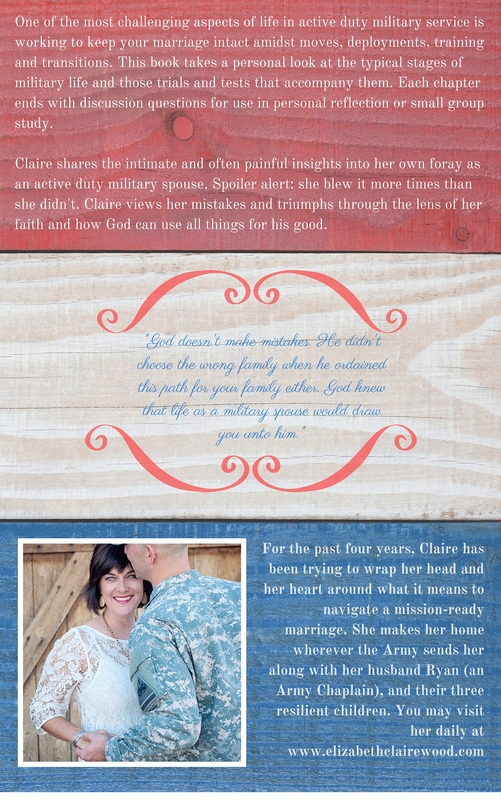 My hope is to spread the word about this resource for anyone who may be struggling to navigate what it means to be married to the military. Chapter 1: Life Before the Military: How in the World Did We Get Here? Chapter 9: Moving? So Soon? I have no idea who this book may reach. I have no idea if it will interest anyone besides a handful of people who share my last name. What I do know is that as military spouses, we so often find ourselves waffling between what it means to walk out our faith in Christ and live in a very real culture of fear, doubt, stress, battle fatigue and loneliness. At least I know I have. And still do. The Lord has placed in my heart this testimony of his goodness and faithfulness as he is continuing to write the story of my life. I may never be a world renowned author but I’ve placed my life in the hands of the Author of the most renown. I may never fully understand the world of the U.S. Army but I serve the God of angel armies and trust that his plans and purposes will never fail. For all of the challenges and trials that active duty military life may throw our way, I want our marriage to withstand the difficulties. 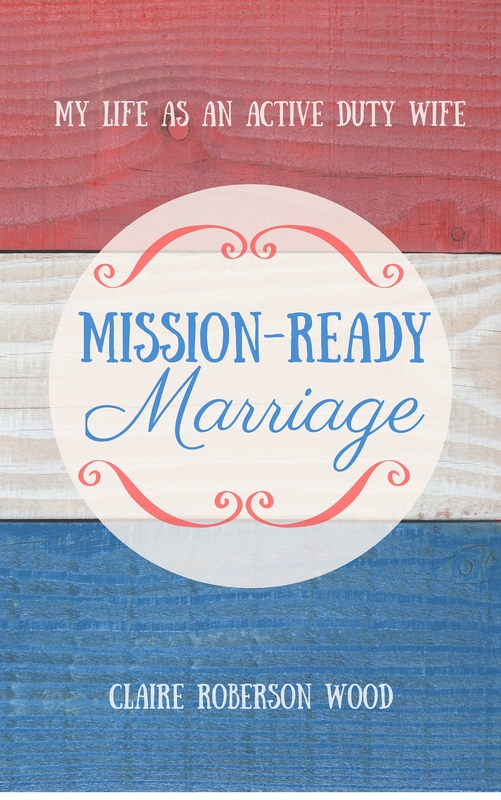 I want our marriage to be a mission ready marriage. The Army assigns each soldier a Battle Buddy. The purpose of this relationship is for a Battle Buddy to assist his or her partner both in and out of combat. The same is true for marriage. God has given me in Ryan a partner to walk through this life. But God is in the mix too. When we surrender our lives to him and place our marriages at his feet, we invite God’s handiwork to be on display in our marriage covenants. This book is the resource I wish I had four years ago when Ryan was commissioned into the Army. This book tells the truth about what-to-expect-when-you’re-Armying; it gives an honest look at the potential, painful challenges of signing your life away to someone else’s plans and it offers hope for navigating your role as a dependent. I love it, Claire! This looks great!! Thank you Kara. I appreciate the feedback. This will be a great resource, Claire! The cover is beautiful and the chapters make me want to read it NOW! I pray it is the first of many offerings from your gifted mind and heart. Thank you so so much Brenda. Your constant encouragement and support means more than you realize. xoxo! Looks great and like an interesting read!!! … please don’t shoot me but since you said these were mock ups – intact is one word in this context 😀 .. This is so exciting! I’m already in love with your creativity (cover) and writing style. I would be very interested in obtaining a copy of your book. My husband has been a active duty service member for 26 years now. We are currently stationed in Seoul, South Korea. I will definitely share your book on my FB page and on our spouses page here at Yongsan. I am a Military wife, and was referred here by a sweet friend of mine, Emily Stone. I am VERY interested in reading your book. I’m even more interested in finding out where you are stationed! We are currently on orders to JBER, Alaska. I would love to get a copy of this book so I can share it with our PWOC group here at Ft. Bragg, as well as with my new group once I arrive in AK. Thank you for sharing your heart, a lot of times people just DON’T get it! We have been living this Military lifestyle for 8 years now, and as you well know it’s not easy. I look forward to reading this, hopefully soon! Wonderful!! So glad we’ve connected! Claire…..this is so good! I’m so excited about all the people this will touch….all that lies ahead through your writing! Jim and I are so proud of you!!! Kathy, thank you! Love you and Jim and appreciate y’all bunches. I’m so proud of your faith and courage to step out and act on the Lord’s direction!!!! I LOVE THE DESIGN!!!! Your writing is an art! I pray this book touches the WORLD!!!! YOU.GO.GIRL!!! Thank you so much Lindsay! I’m glad you like the design. I trust your eye =) It’s good to hear that! I am willing to give it a shout out on my own blog!! I love the cover colors and the message you are trying to get out! Looks like it’s going to be a wonderful book. I wish I had it to read to help me through military life when James was in the Army. I am sure this will be such a wonderful resource for other families that are walking a similar path! I have always enjoyed reading your blog, and I can’t wait to read you book!! Claire, I’m so happy you’ve done this! I admire your loyalty to everything you put your heart into…So proud to be a part of your family & to call you my niece but most of all, the walk you WALK not just the talk you talk! Much love & success!